Pirate Party leader: "The citizens have understood it's time to make a difference"
(CNN) -- A Swedish political party which wants to legalize file-sharing on the Internet scored a surprise victory Sunday when it took a seat in the European parliament. 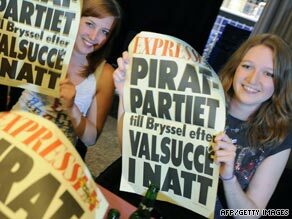 Pirate Party supporters celebrate the party's surprise victory in Sweden. The Pirate Party won 7.1 percent of the Swedish vote to claim one of the country's 18 seats in the European parliament. "Together we have changed the landscape of European politics," Pirate Party leader Rick Falkvinge told file-sharing news Web site TorrentFreak after the win. "The citizens have understood it's time to make a difference." The single-issue party was founded in 2006 through anger in Sweden at controversial laws that criminalize file-sharing. The party's popularity increased markedly in April this year after the four founding members of the Sweden-based The Pirate Bay, a file-sharing site used by millions worldwide, were found guilty of collaborating to violate copyright law and sentenced to jail. Shortly after the conviction, Tomas Norström, the judge who presided over the case was removed for bias when it was revealed that he was a member of industry copyright-protection groups. The membership of the Pirate Party more than trebled following the verdict and now stands at more than 48,000 members, according to TorrentFreak. The Pirate Party's aims include free file-sharing, abolishing the patent system in Europe, reform of copyright law and outlawing digital rights management, which inhibits the ability to copy computer files.